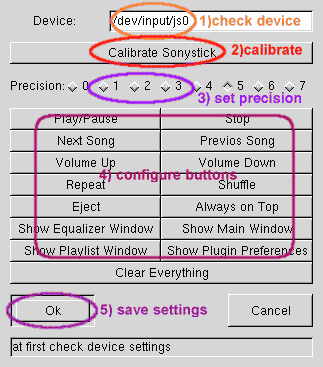 A XMMS plugin, which lets you control XMMS with a Sony RM-X2S control joystick. These are/were shipped with car radios. Version 1.2 from 2003-02-14 xmms-sonyrmx2s-1.2.tar.gz configurations for Linux 2.2 and 2.4. Version 1.3 from 2006-05-05 xmms-sonyrmx2s-1.3.tar.gz for Linux 2.6. The joystick is connected to the game port. You can connect it directly to the gameport. However if you wish to use the joystick button a small circuit is needed. 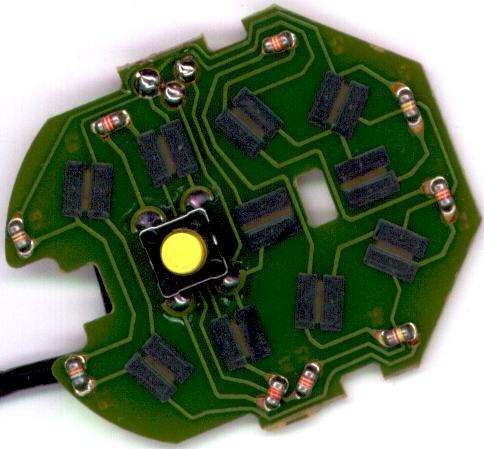 You can fit it into the gameport connector, as shown in this picture. The following ASCII art shows the circuit. 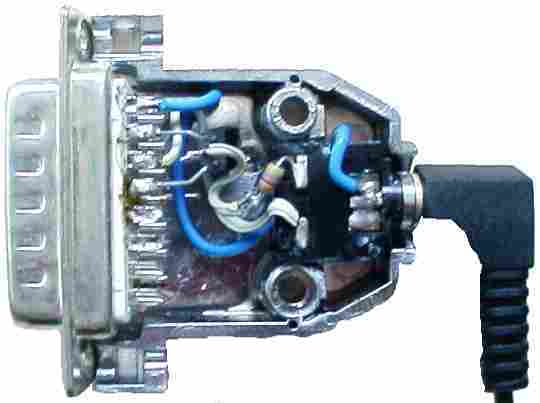 The Joystick Port is a 15pin male Sub-D connector. 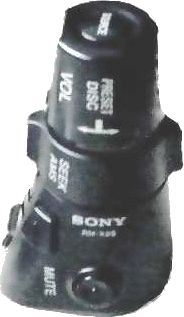 The Sonystick is connected to a 3.5mm stereo jack. The AD pin of the joystick will apply resistances between 0 and 150KOhm compared to GND. If the above lines work, you can place them in a system startup file like /etc/rc.d/rc.local. If you have troubles with the kernel joystick modules read /usr/src/linux/Documentation/joystick.txt. You can insert module options into /etc/modules.conf to load the joystick module automatically by make installmodule. If you are not root, or don't want to install into the global plugin directory use make install-home to install the plugin to your private xmms directory (~/.xmms). Now start xmms and get the plugin configuration panel with CTRL+p. 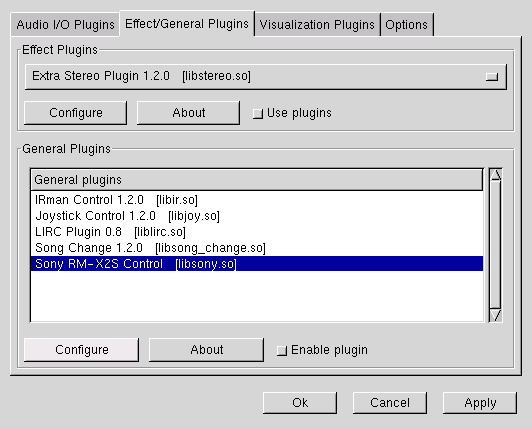 Select the plugin and click the Configure button (picture). Now set the precision to 5. If you experience difficulties when using the joystick (events without touching the joystick or some buttons having the same event) you can alter this setting. Lower values make the joystick more precise, thus harder to control. Configure the buttons. A beep indicates that an event was successfully recorded. Pressing the OK Button to save the configuration. Cancel will not save any changes made to the configuration. Finally you can enable the plugin in the XMMS preferences window. Markus Strangl gave me the following information. The RM-X1S is not compatible to the X2S. It does not use resistors to diversify the buttons, but an IC chip. You can not use this driver software with the RM-X1S. However look at out RM-X1S conversion page how to modify this a a full fledged infra-red remote control. The RM-X2/3/4S are absolutely identical, they only come with different text labels because they were designed for different radios. The two trapezoid and the one rectangular button on the bottom half later came with adhesive labels to save production costs, the top twist knob on the x3s is labelled for an autoreverse cassette deck. The X5S is technically the predecessor of the X6S and interchangeable for most radios. Both the 5 and the 6 are using high-speed infrared codes, and are not usable with lirc (serial link is too slow). Though there might be a chance to get them to work through an IR-DA port (4 Mbit). While the X6S looks like a hockey puck, the X5S' design is identical to the X2/3/4S, just with a 2cm high base for the transmitter. Charlie Payne has informations how to wire an RM-X6S to an empeg car radio.